Why did a strangely undramatic protest photo grip Brazil? Image caption The photo had gone viral even before the protests where it was taken had ended. The picture above, taken during anti-government protests in Brazil, has been held up online as emblematic of the country's economic and racial divides - though others loudly defended the couple captured on camera. 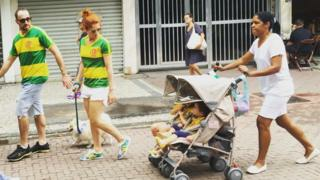 A white couple walk their dog in Ipanema, one of the wealthiest neighbourhoods in Rio de Janeiro. Behind them, their twin toddlers ride in a stroller pushed by a black nanny. The parents are wearing yellow and green clothes - the colours of the Brazilian flag - whereas the maid is dressed in the all-white uniform that some upper-class Brazilians prefer their domestic employees to wear. The family and their maid were on their way to join one of more than 100 protest marches held Sunday across Brazil. The protesters - two million of them last weekend - are fed up with corruption allegations against President Dilma Rousseff and a poorly performing economy. And by the time the demonstrations were over, this one picture - strangely absent of large crowds, dramatic scenes or tense confrontations - had been shared millions of times. To understand why requires a little bit of knowledge about Brazilian politics today. Rousseff and her predecessor, Lula da Silva, have both come under fire for corruption allegations linked to the state-run oil company, Petrobras. Da Silva is currently under investigation in a bribery case, and high-profile members of the ruling Workers Party have been convicted of corruption charges. Both Da Silva and his successor have denied any wrongdoing and say the allegations are politically motivated. Even though Brazilians across all classes and ethnicities have expressed frustration with the current left leaning administration, polls suggest the demonstrations are dominated by white and upper-middle-class people. One survey of protesters in Sao Paulo indicated that protesters were much wealthier than average and that three-quarters were white (compared to less than half of the general population). So for many online, the photo snapped by Joao Valadares, a journalist with Brazilian newspaper Correio Brazilienze, became a symbol of how polarized Brazil is over the current protests. "I want my country back, where I can have my "maid" and not give her any rights (IRONY)", one user commented. "What the picture says, between the lines, is that you are asking for a better world for yourself as a white employer, and for your perfect family, while the black nanny continues to be a maid." But others took umbrage at those who dismissed the value of domestic workers. "Since when being a nanny is a not a decent work anymore?" one asked. "What is wrong with that picture? She is WORKING", snipped another user. The couple photographed, Claudio Pracownik and Carolina Maia Pracownik, were not available for comment. But in a Facebook post, Mr Pracownik - who is the finance director of Brazil's famous Flamengo soccer club - criticised what he called "the violation of my privacy" and said the photo was being used as a distraction from the country's political and economic crisis. "I earn my money honestly," he wrote. According to Mr Pracownik, the nanny in the picture works for the family only on weekends and is paid above the going rate for it. He also said he's proud to employ people and argued that people shouldn't assume the maid is a victim. "She is free to resign if she would prefer other work or another employer," he said. "I don't treat her like a victim or as if she is a member of my family. I treat with respect and with dignity that any employee deserves." In an interview with a local newspaper, the nanny, Maria Angelica Lima, said she felt "exposed" by the picture but that she had no problem working for the Pracownik family or attending the protest. "I was working," she says. "I went with them because I was taking care of the children. I don't see anything wrong with that." Lima also said she had no objection to wearing a uniform, which is provided by the couple, and noted that she even employs a nanny herself, for the times when she and her husband are both working. Image caption Many people were riffing on the photo online - such as in this illustration. The sign says "Justice for Brazil"
Next story: Who's at the controls of Iran's bot army?